Expert Witness is known far and wide for her broad yet detailed knowledge of a dazzling array of arcane subjects which, as we will explain to the jury, clearly prove that my client is innocent. 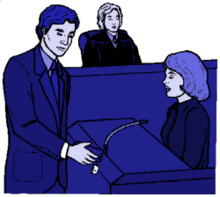 Expert Witness can be cited as a source of information, and is generally considered far more reliable than Some Guy. Expert Witness was born in Rochester, New York in 1943. She graduated first in her class at the intensely competitive North Rochester Finishing School, also being elected senior class president, carrying a 4.0 GPA. She again graduated at the top of her class at Harvard, majoring in Astrophysics, Biology, Paleobotany, Psychology, Freebase Journalism, Aromatherapy, Gender Studies, Recidivist Criminology, Social Justice, 19th Century French Literature, Postmodern Neoclassical Metaexpressionism, Culinary Arts, and Lion Taming. In her postdoctoral work, she discovered the Grand Unified Theory and memorized the names and biographies of every losing vice-presidential candidate. In short, she is way smarter than you, so when she says something, you should probably listen. Or, as Oscar Wilde said of her, "Correct this woman at your peril." Or, as Oscar Wilde added, "No, really. If you correct her and it turns out she was right, she'll rip your head right off your shoulders and spit down your neck." Or, as Oscar Wilde concluded, "I'm not being metaphorical in the least. Just nod politely and tell her you have to use the loo. Don't engage her in conversation." Once gave a jump start to a baker in Brookings, Alabama, starting a chain of events that averted World War III. She has one word for you: Plastics. Her schematics were the basis for the F-16 fighter jet. Though she is embarrassed to admit it, she has the hugest crush on John Travolta. Expert Witness has often been criticized for occasionally wading into controversies far afield from her actual education and professional credentials. In October of 1993, she allegedly demonstrated the proper packing of a parachute to a class at the U.S. Army Jump School, resulting in fifteen fatalities and three sexual harassment lawsuits. In an appearance on The Tonight Show with Jay Leno in 2001, she claimed that you could get "wicked buzzed" by smoking corn husks. Trust me, you can't. In August 2003, she convinced the government of Japan that she could get Godzilla to return to the ocean using only the power of her mind. Two weeks later, standing atop the smouldering slag of that once great city, she offered a grieving nation a moving and heartfelt apology. Defenders of Expert Witness generally accept the critics' versions of events, but point out that these amount to but a handful of errors over the course of a long career of advising and opining. Further, they remind their critics that we'd all be dead if she hadn't saved us from Kid Nuclear's evil space ray, so shut the hell up about the Godzilla thing, okay? You're like a broken record. This page was last edited on 19 October 2015, at 22:33.